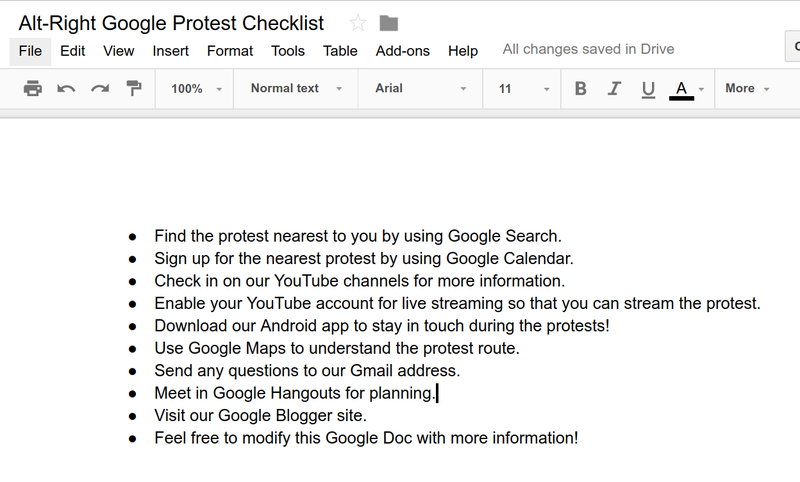 Author LaurenPosted on 15 Aug 2017 20 Sep 2017 Leave a comment on I Found the Alt-Right Google Protest Checklist! In the wake of the deadly alt-right demonstrations in Charlottesville, replete with explicit racist, antisemitic, Nazi-era imagery and chants, it’s been widely noted that Donald Trump has refused to specifically condemn the alt-right, Neo-Nazi, white supremacist, white nationalist movement that triggered the violence, nor to explicitly note the apparently dedicated alt-right beliefs of the driver who murdered one and injured many by plowing his car into a crowd of persons protesting against these groups. That Trump has been reluctant so far to condemn these hate groups and their members, who insist that they’re doing what Trump wants them to do, and who are such a major portion of his voting base, is not at all surprising. Perhaps in coming days he’ll feel the political need to say something more direct — but we know he’ll only do so under extreme duress. Part of his original insipid, blame everybody on “many sides” attempts at creating false equivalence between these genuine and wannabe Nazis — vis-a-vis the protesters against them — was the all too familiar call for us to “come together as one.” But what does that really mean? We can apply Spock-like logic to this one. Fundamentally, we have two sides in this conflict. One side is blatantly and proudly racist, sexist, and antisemitic, spouting the same hate that their forebearers have been spewing since before the Civil War. The other side is opposed to these hateful paradigms. Despite what Trump seems to imply and fervently wish, there is no moral equivalency between these two diametrically opposed attitudes. Especially in the wake of WWII — largely fought against exactly these kinds of hateful ideologies under discussion here — we’ve worked very hard to keep the Neo-Nazis and their ilk compartmented and isolated, away from the mainstream of civilized society. And until fairly recently, we were pretty successful at this. The rise of the Internet, social media, and the income streams flowing from Net-based advertising changed this dynamic, and the election of Donald Trump was seen by these groups as a green light to go mainstream again. They have grossly miscalculated. Major Internet firms are now pushing back on their lying, hateful propaganda in a variety of ways — see: “Google Has the Alt-Right Running Scared” (https://lauren.vortex.com/2017/08/12/google-has-the-alt-right-running-scared). And the “coming together” pleas are being widely recognized as the illogical and banal babblings that they are. Because — let’s face it — exactly who is going to come together? And how? Are the alt-right racists and antisemites going to give up generations of Confederacy-inspired dogma? Are the rest of us supposed to accept their hateful view of the world? Or are we urged to somehow “compromise” — perhaps we move 50% toward accepting their hate, while they move 50% away from their hateful ideologies? They’re not going to join us. And we’re most certainly not going to join them — no compromise is possible with such evil. The only practical and ethical path forward is to push that evil back into its corner where it used to be, by condemning attempts at false equivalence and cutting off their ability to leverage our technological platforms to finance and spread their wickedness. To the extent that their speech is not inciting violence (though all too often it does exactly that) they have a First Amendment right to spout their filth free of government interference — but the rest of us are not required to countenance their malevolence in our social media or search ecosystems. When vampires suggest to you that “we come together” it’s pretty clear where you’re going to end up if you accept their recommendation. It’s the same with the alt-right, their cohorts, and anyone who supports or tolerates them. Our job now isn’t to come together with such evil — it’s to drive a stake through the heart of their newfound mainstream acceptability, and to fully take back our great country from their spreading malignancy.